Lessons are taught in individual classrooms in Guitar Haven, 1873 S. Patrick Drive, Indian Harbor Beach, Florida. 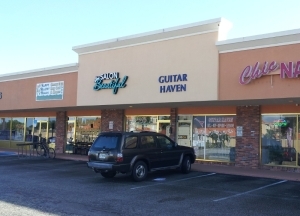 Guitar Haven is located on South Patrick Drive approximately 1/2 mile north of the Eau Gallie Causeway. Click here to go to the Rick Fincke YouTube Channel.